Fisheating Creek is one of the largest fairly natural areas on the Florida peninsula. 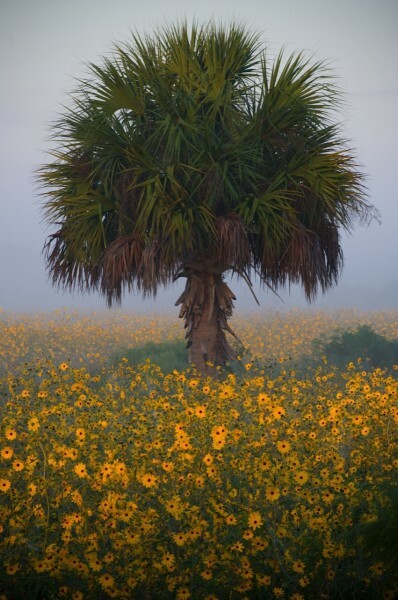 Today it is the only undammed tributary to Lake Okeechobee, gathering in the prairies and flatwoods of Highlands County and flowing lazily east, through soaring cypress domes and vast marshes. The land around Fisheating Creek is primarily owned by Tampa-based agricultural conglomerate Lykes Brothers, Inc. The Fisheating Creek Ecosystem Florida Forever BOT project encompasses 177,000 acres of the creek, 68,000 of which is currently under conservation. This a key landscape for connecting several major hubs of conservation land, tying together almost the entire southern peninsula. It is the key component of a corridor from Lake Okeechobee west to Babcock-Webb Wildlife Management Area, which is a 73,000-acre Florida Forever BOT project north of Ft. Myers. Due to the largely natural landscape of Glades County – most of which is owned by Lykes Brothers – there is good connectivity from Fisheating Creek south to the Caloosahatchee River. At the Caloosahatchee River and east of LaBelle, several additional Florida Forever projects constitute the best remaining hope for a wildlife corridor connecting through Okaloacoochee Slough State Forest to the Fakahatchee Strand and the Big Cypress Region to the south. Fisheating Creek and the surrounding landscape is the next frontier for the endangered Florida panther. Though wide-ranging males have been documented in the landscape for many years, there are no female panthers known to be north of Hendry County. Males that make it north of the Caloosahatchee enter a landscape lacking mates, essentially removing themselves from the population. If a female cat were to establish a home range north of the river, she would most likely include portions of the Fisheating Creek drainage. The subpopulation of black bears of south-central Florida finds refuge in the dense forested habitat associated with the creek. The threats to survival for the regions’ black bear mirror those faced by the panther; the Caloosahatchee forms a barrier to bears moving south to exchange genes with the subpopulation of southwest Florida and the Big Cypress. In addition to panthers, the creek is considered a Strategic Habitat Conservation Area for a multitude of other species. Swallowtail kites gather by the hundreds over the cypress domes in early summer, in preparation for their migration to central America. Adjacent to the creek, red-cockaded woodpecker families nest and breed in old-growth longleaf pine flatwoods. These clusters represent some of the southernmost members of this endangered species. Crested caracara are frequently seen perched along pasture fencerows or scavenging roadkill on SR 29. Sandhill cranes families work the pastures. The mottled duck and short-tailed hawk draw birders in search of rare species for their life lists. From the air, Fisheating Creek appears as a green vein winding through a marshy, open landscape. This is one of the largest uninhabited and least road-dense areas left in the state. U.S. Highway 27 divides the project roughly in half, but the rest of the roads in the area are rural and receive, on average, less than 1000 cars a day. Improved pastures and planted pines are interspersed with freshwater marshes, dense oak-palm hammocks and broad swaths of pine flatwoods. Given the size of this natural gem, it is extraordinary that it remains relatively intact. The project area includes at least 31 archaeological sites, many associated with the important Fort Center Site Complex of the Belle Glades culture (500 B.C. to A.D. 1700). There are likely many more important sites within the project. Given all the biological and cultural significance of the land, it is easy to understand the high priority status Florida Forever and natural resource agencies have placed on this project.